The most fun way to spend time with friends or family. 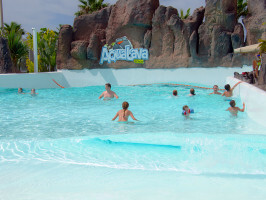 Visit Aqualava Water Park and enjoy an unforgettable day out. 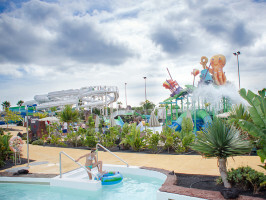 Live a refreshing experience in the most modern, fun, safe and sustainable water park on the island. Located in Playa Blanca, it has modern attractions worth highlighting for their security and quality. 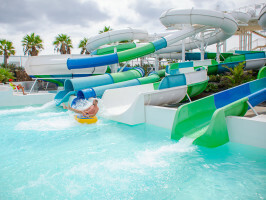 Feel the adrenaline in any of the five enormous toboggans with or without rings (Timan Fire), dive head first into the popular Aqua Bowl or simply float along the currents of the Magma River. 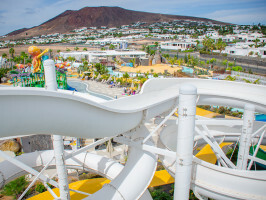 For the little ones, there’s Corsario Bay, an area full of toboggans and swimming pools for children, whose main attraction is crowned with a giant octopus that might sting you with water at any time! 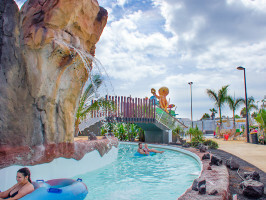 Feel as if you are on a real beach in the saltwater wave pool (Aqualava Beach), the only in Lanzarote, or submerge yourself in the geothermally heated pool. What’s more, have fun with peace of mind: the park has an on-site nursing service and qualified lifeguards at every attraction. Keep energy levels topped up at the Timi Kitchen, a restaurant offering menus and buffet, or visit Timi Shop if you´re in search of snacks, ice creams, sweets and souvenirs. November Offer! Get a FREE high-quality hot dog with your ticket. Meeting / Pick up time: Transfer from Puerto del Carmen at 9:10am and Puerto Calero 9:45am. Transfer from Costa Teguise at 8:35am. Languages: English speaking staff in the park. Others: New menu option – Corsario Burger, Italian Menu and Hot Dog Beach. Pick-up location and pick-up time: Please confirm the time and location for pick-up with 24 hours’ notice prior to the activity by calling the following telephone number: 0034971211601. Please note that transfer from Costa Teguise is not included in the price, bus fee of 4 € (return ticket) to be paid at the entrance.